What you're seeing here is the same scene rendered in Poser 10 and Poser 11. The slight differences in the drape of the dress are because I had to re-run the cloth simulation due to Poser 11 using a different format for the dynamics cache. You can see that the Poser 11 render - using exactly the same render settings, remember - is significantly worse. Those horrible blotches on her skirt won't go away no matter what I do to the render settings, and I've seen similar artifacts in many other scenes: on dynamic clothing, on figures, on landscapes, and on vehicles. The common factor appears to be a gentle curvature, although there are plenty of instances where a gently curved surface does not attract blotches. I've gone so far as to buy a copy of Poser 10 purely to do artifact-free IDL rendering in. I would have preferred PP2014 for the 64 bit renderer, but my budget wouldn't stretch that far. Of course the ideal solution would be for Smith Micro to un-break the poser 11 renderer. What say you, guys? @englishbob I got those same blotches on a couple of renders I did to finish up some work I started on PP2014. Yes there is a problem with the firefly render engine now with regard to IDL but I have a feeling that they wont be fixing this any time soon. @ghostship I had this same issue in PP2014. It only occurs when using point lights. @mr_phoenyxx I'm not using point lights in the renders that I had this issue with. Envirosphere + 1 infinite light. @englishbob - a few suggestions I can think of (bearing in mind I never actually used D3D's script much). I would try pixel samples at 6, increase Irradiance Cache, reduce minimum shading rate to 0.2 & set filter to sinc at 2 or 3. IC & shading rate being the important ones IMHO - I would also change one at a time to see what the difference was. The other option I'd try would be to add one level of render subdivision to the dress. Irradiance Cache can be switched off to get best quality but the render times will go through the roof. IC is a trade-off - the higher it is, the more accurate the calculations but the slower the render will be. That's my understanding of it anyways. IIRC, when I first encountered this, I think I decreased the Shadow Minimum Bias on all the lights to around .4 and that cleared it up, nicely. Increasing shadow samples helped a little, too, but wouldn't get rid of it. Thanks for the suggestions, everyone. It's interesting to see that some of them contradict each other. 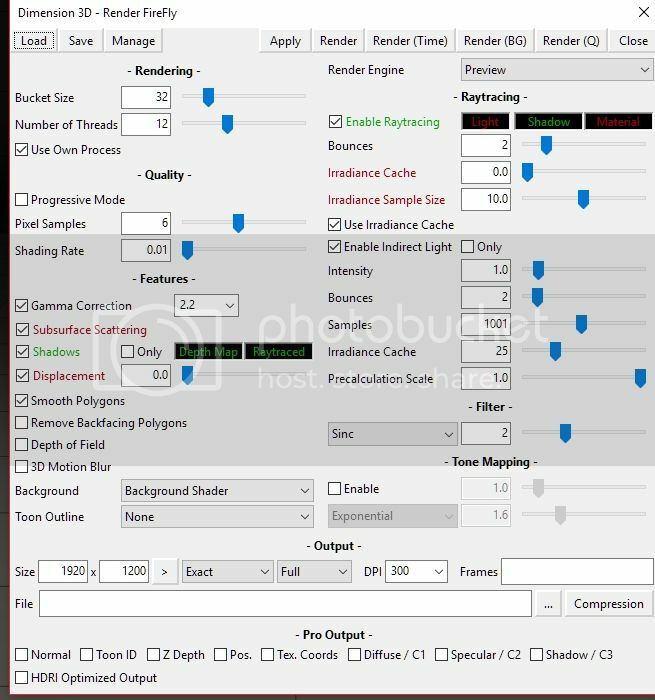 If I can find settings that will give me consistently usable IDL renders in P11, I'd be happy; but all the indications so far are that there are none. I have already done a lot of methodical tests on another scene. I varied one render setting parameter at a time using the D3D script, saved the render, and also noted how long it took. I went through 20 permutations in all. Although some settings were better than others, none were really ideal, and variations mainly seemed to move the artifacts around instead of getting rid of them. I shall have to go through that exercise again on this scene and see what I get. Dimension 3D's script gives access to parameters that are not available through the normal render settings dialogue, so allowing greater control. I'm not sure what everything does (there are two Irradiance Cache sliders, for example) which makes it hard to design a scientific experiment instead of flailing in the dark. Hence I settled for just changing one variable at a time. If there are more complex interactions going on then I don't stand much chance of discovering the sweet spot by chance. I haven't tried turning off the irradiance cache yet because of the render time penalty, but I must do that exercise some time. Counter-intuitively, turning the irradiance cache slider down seemed to give the most palatable results, whereas turning it up from 50 (the default) to 100 rocketed the render time on my previous test scene from 14 seconds to nearly 7 minutes! I'll continue my researches, anyway. @englishbob Purely out of curiosity, what Preview Drawing are you using in each renderer? Thanks for the suggestions, everyone. It's interesting to see that some of them contradict each other. Sorry, I'm not familiar with that term. Where could I find that information? @englishbob It's Under the display menu. I Blanking on what one of them's called now, but the other is Skreed. Sir, we have a warrant for your arrest. LOL. Thanks Jura. I tried your settings on my scene (except for the render size), and the results were the same: Poser 10 renders better than Poser 11, which was my original point really. You can see the blotching where the folds in her skirt are. The difference between our scenes is that your dress is close fitting and doesn't have folds. I think the Poser 11 IDL algorithm is going wrong when it has to deal with areas which are both curved and not well lit. Somewhere on the way from the previous version to the latest one it got broken. @englishbob You can resolve this by upping the subd to 1 on the dress. It really is a combination of the mesh and the lights that is causing it. @englishbob BTW, I really like that dress. Where'd you get it? Well, yes, subdivision works insofar as it brings the quality roughly in line with the un-subdivided Poser 10 render. Subdivision improves the Poser 10 render also; Poser 11 is always lagging behind. Besides, it's a simple matter to subdivide the dress in this scene. It's not so straightforward to subdivide Vicki 4, or a high-poly vehicle, which are both situations where I've seen this problem. To be clear, I have a solution to reliable IDL rendering: use Poser 10. It's a pity that I have to do this, that's all. I also suffer a performance hit because Poser 10's renderer is only 32 bits; Poser 11 has a 64 bit renderer and can use more memory. It consistently goes faster even on a simple scene like this one. It's a conversion of Slim McKenzie's free Spring Dress for G3F. I made a similar dress with the intention of distributing it for others to try, but frustratingly it doesn't seem to prompt the same level of artifacts.